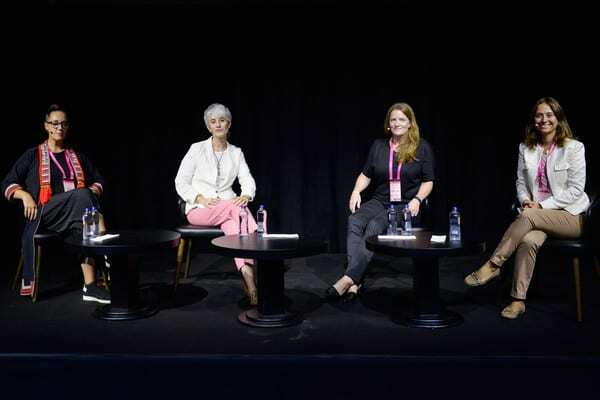 On the 13th of September The Sustainable Angle’s curator Amanda Johnston was invited to join the Lenzing Sustainability panel discussion during Mercedes-Benz Fashion Week in Istanbul. This year the event was held at the Zorlu Performing Arts Centre, nestled within the luxurious Zorlu shopping centre. The history of Istanbul Fashion Week only dates back to 2008, then named Fashion Lab, expanding to become a fully-fledged fashion week in 2010. 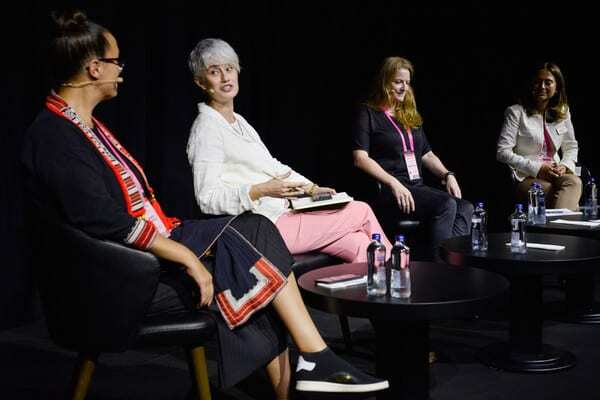 The panel were greeted by a packed theatre with a diverse audience comprised of fashion fans, industry insiders, buyers, journalists, bloggers, influencers and photographers. 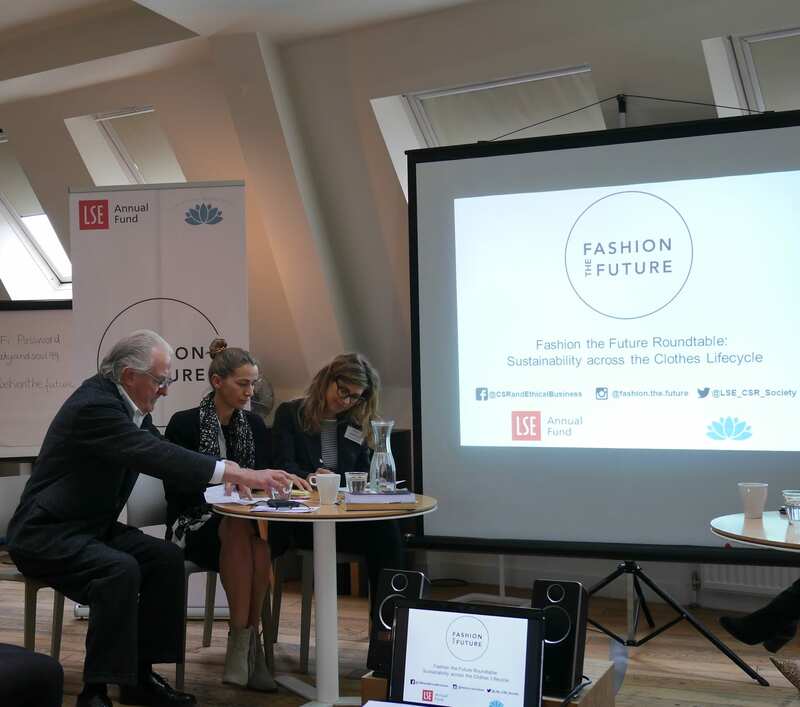 The discussion was chaired by renowned journalist Ferhan Istanbullu, and the panel was coordinated by Hale Saracoglu from Lenzing, who also contributed her expertise in the fashion industry supply chain and in the field of man made cellulosics. She conveyed the importance of clear communication around sustainability to the discussion. Hale explained and highlighted the FSC certified wood feedstock, closed loop production process and key benefits of different Lenzing fibres such as Tencel™, Eco Vero™ and Refibra™. Ferhan was interested to hear the panel’s thoughts on defining sustainability, and to frame the importance of our fast fashion habits as contributors to the culture of fashion consumption. The panel observed that with fast fashion we have been led to consume very easily in excess quantities. We can throw away the products we don’t like or we don’t want anymore so easily, as their price suggests that their value is disposable, and we have lost the desire, patience and knowledge to care for and repair our clothing. The challenges designers and brands face today is in implementing holistic sustainable practices- and understanding that sustainability goes beyond choosing the right fibres or production processes, but is also about the quality and longevity of garments, in order to stem the huge environmental impact that comes from today’s throw away culture of clothing. Amanda introduced the work of the The Sustainable Angle, what we do, and how we developed our criteria, highlighting examples of more sustainable and responsible materials for fashion in both man-made and natural fibres which have a low environmental impact, highlighting the variety of choices available and the necessity to move away from unsustainable non-renewable virgin polyester and conventionally grown cotton currently dominating the market. We discussed the need for diversification of the global fibre basket, and the crucial need to develop circular models throughout the textiles supply chain, and through to product in order to provide solutions to our growing, and unmanageable material waste streams. We shared the interest from industry partners in projects that propose how we may think differently about material sources in the future, and how we manage those waste streams. 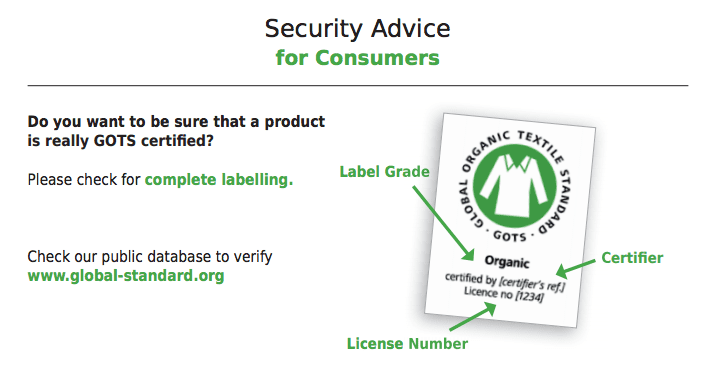 At retail lack of information on labels means that consumers don’t know where the fabric come from, what is it made of? The answers to these questions and transparency of process are important. For example TENCEL™ branded fibers come from trees. But, understanding the processes that makes the fibre, yarn and fabric are as important as the raw material of fabrics, only this way we may understand its impact to the environment and make informed choices when we shop. The need for full transparency of information, certifications and supply chain traceability being key. Simone flagged up an opportunity and observed that Turkey is a key player in Denim production in the world, and that Textile Exchange believe that Turkey is poised to play an important role in the successful recycling of Denim in the future, lowering the impact on natural resources and initiating an important step towards the circular economy for textiles. All agreed there is now an urgency to investigate how we can produce raw materials more sustainably, and innovate, by first thinking in a solutions based way. Also, discussions about some of the new innovations and solutions, developed to address our most pressing sustainability issues, including leather alternatives and the interest in recycling technologies and pre and post consumer industry and food waste materials suggested a new, responsibly produced materials landscape for the future. The discussion concluded with a Q&A, of not only consumer habits and how to make the right fibre choices, but most importantly of how to think creatively, how sustainability should be recognised as a game changer and an opportunity, for businesses to future proof their operations. The discussion also drew attention to the significance of the impact that we as consumers and industry practitioners can have through our everyday choices. Many thanks to Hale and the team at Lenzing Istanbul for their organisation and hospitality. 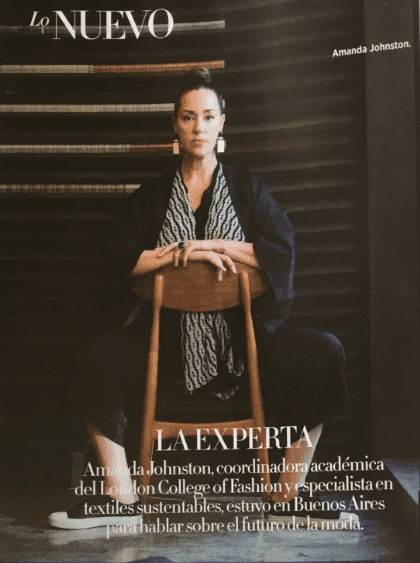 It was a great pleasure to be interviewed by Harpers Bazaar Argentina for their November issue, during my recent visit to Argentina to participate in INTERDISENO 2016, the University Network knowledge exchange program. After a hectic day at INTI headquarters, meeting staff teams and delivering a lecture to an audience of SME’s, I met with Harpers magazine’s journalist and photographer in Buenos Aires’ cool Palermo district to share a drink, and to talk about sustainable fashion and textiles, and consumer culture. We are really pleased to announce the release of Fabric for Fashion: The Complete Guide: Natural and man-made fibres. The book was written by The Sustainable Angle’s curator Amanda Johnston and Clive Hallett, who wrote the first edition together. If you haven’t already seen it, the accompanying volume Fabric for Fashion: The Swatch Book is very much worth a look too, containing over 100 swatches of widely used fabrics. The book is an essential and easily navigable reference on a seemingly unending range of fabrics, providing in-depth details of their properties, technologies, terminologies and processes. Amanda and Clive have ensured the book “examines not only the visual and tactile characteristics of various fabrics, but also encourages a deeper understanding of their potential impacts by considering the provenance of fibres, and their processing routes.” This is something that we are always aiming to do at the Future Fabrics Expo as well, as by physically experiencing a fabric whilst being provided with the relevant in-depth information about provenance and processing, we are able to more accurately judge a fabric’s sustainability credentials, whilst evaluating relevance for the desired end application. The Sustainable Angle’s involvement did not stop there. Charlotte Turner from The Sustainable Angle was invited to contribute to the book, researching and creating an easy to use certifications reference guide to help designers understand the scope and remit of the industry’s increasingly used certification systems. Whilst certifications are not the only way to determine the social and environmental credentials of a fabric, they can often help understand the benchmarks to which diverse materials have been produced and processed. As certifications can relate to anything from use of chemicals and fertilizers during fibre cultivation, to fair working conditions, treatment of waste-water effluent, or design for reutilization, it can be a confusing area to navigate. Take at look at the guide to find out more about some of the most commonly used social and environmental certifications (p.240-243). At The Sustainable Angle, in addition to evaluating fabrics using globally recognized certifications, we also assess fabrics against a set of environmental criteria developed with the Centre for Sustainable Fashion, which can be seen here. Added to this, “the fibre and fabric journeys of both the natural and man-made fibre types are explored by mapping the historic, social and geographic significance of the fabrics that make up the very substance of our contemporary fashion products.” All in all, the ingredients for an invaluable textiles resource. For those wanting something creative, the book includes hundreds of beautiful fashion and textile images, several photographed by the talented Myka Baum, whose photography of the Future Fabrics Expo you can see here and here. You can find out more and order the book on the Laurence King website. As well as curating for The Sustainable Angle, Amanda has spent several years working with the London College of Fashion as an associate lecturer, and as a freelance design consultant. Clive and Amanda have worked together as consultants within the fashion industry since 1982 having collaborated on numerous projects both in the UK and abroad. We are delighted to announce that The Sustainable Angle has been selected as winner of the UAL Sustainability Award 2013. The award recognises the achievements of The Sustainable Angle as an organisation, and of the core team who have been bringing these projects to fruition over the past 3 years – Nina Marenzi, (Director), Charlotte Turner (Project Manager), and Amanda Johnston (Curator). 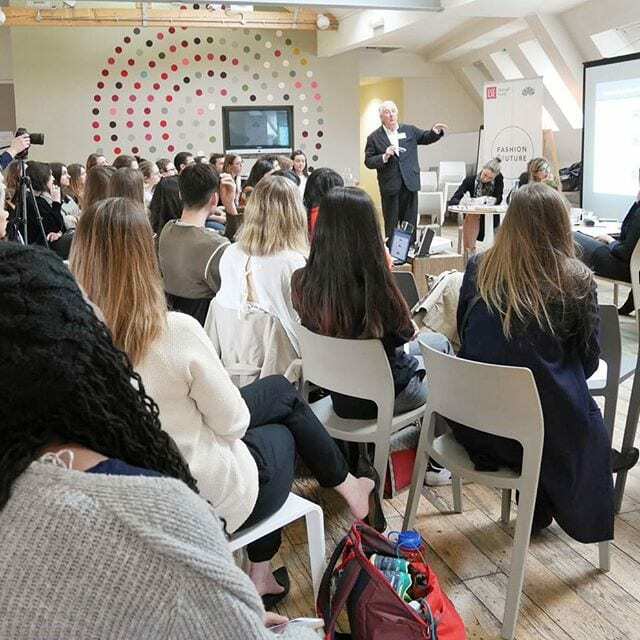 The panel particularly liked the way The Sustainable Angle’s projects create the conditions for extensive learning, operating with a holistic view of sustainability and education and that successfully engage with parallel networks to foster connections and collaboration. 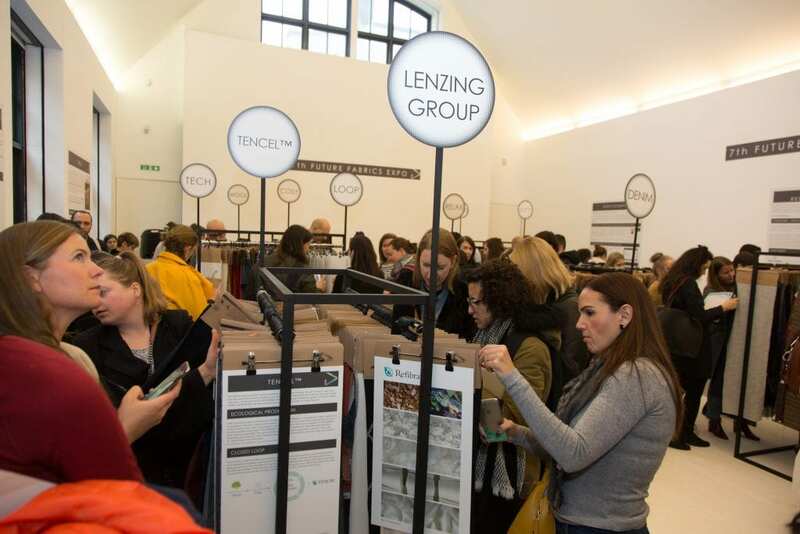 There was also key focus on the fact that The Sustainable Angle’s projects, (most notable the Future Fabrics Expo), have made a significant impact across a range of stakeholders including social enterprises, business and both UAL and non-UAL students. We are extremely pleased to have received this recognition, and look forward to bringing together the 3rd Future Fabrics Expo in London, 22nd – 24th September. We’re pleased to say we have contributed another in-depth article to the Ethical Fashion Forum Source online platform to help offer some of our latest research and advice on making your supply chain more sustainable, which we’ll also share at the next Future Fabrics Expo at the end of 2013. You can read our previous article on The Future of Fashion Fabrics here. In this latest research we wanted to highlight how the supply chain is an interlinked series of decisions – starting right from the very raw materials our fabrics are made from and their cultivation and processing, to the finished garments we are wearing which have been assembled by labourers around the world. Understanding exactly what the supply chain really entails is key to being able to make it more environmentally, socially, and economically sustainable. There have been some great steps made by international not for profit organisations, businesses, initiatives, and researchers, which can contribute to us measuring our impact and improving our supply chain process, and we have shared some of our favourites with you. Additionally, from luxury materials made with extra long staple organic supima cotton, and performance fabrics incorporating post consumer coffee waste, soy plants or recycled fishing nets, processed with oxygen bleaching or airflow dyeing, to locally sourced wool which travels only 40 miles from sheep to finished fabrics, there are a huge range of options to reduce our environmental impact in our choice of materials, more of which you can read about in the full article. Click here to read the full article on the Ethical Fashion Forum website. You can take a look at The Sustainable Angle’s new article on the Ethical Fashion Forum Source Magazine about reducing the environmental impact of the fashion industry through innovation in textiles. Environmental and social impacts of the fashion industry are growing, but there are many ways that you can not only reduce negative environmental impact, but also increase positive environmental and social benefits through informed choices of materials and intelligent design. Thinking critically about materials is just one option, which is not an isolated solution, but part of a considered and linked chain of positive choices along the supply chain. 23% were other fibres – of which 13% were polyamide, polypropolene, acrylic and other synthetics (1%), and 10% were wool, viscoses, other naturals and cellulosics. Therefore there is a massive need for fibre diversification to avoid natural resource depletion and support thriving eco-systems, in light of the overwhelming global use of such a small range of fibres despite growing availability of innovative fibres and fabrics. In 2010 the global textile industry ‘experienced the most potent growth in 25 years’ (Oerlikon Textile Report), with an increase of 8.6% – with such a rapid growth of textiles on offer, it is imperative to make informed and responsible choices.